This is it, friends — the night on which I share with you my efforts to make dinner for less than $1 per person. In other words, dinner — a healthy, unprocessed, filling, hopefully delicious, and generally well-sourced — for $4 TOTAL. It’s hard. I’m not going to lie. Hard to put into practice everything I hold dear about responsibly farmed and sourced ingredients, plus everything I believe about making a satisfying family dinner, while keeping myself on such a strict budget. Frankly, while I’m the first to say that it is NOT a requirement of eating properly to spend oodles and oodles of money, I don’t think $1 per head — or even $2 per head — for our evening meal is anywhere even comfortably close to what I usually spend. We are, I believe, roughly $3 dinner people…and I’m cool with that, because it means approximately half of my grocery budget goes to our dinners. That seems about right, proportionately speaking. Anyway, tonight’s dinner was a TOTAL experiment, and a happy one at that. I’m pleased to report that no family members were harmed in the making of this cheap-eats blog post. Even better, J. pronounced my efforts “really good, actually,” and both boys willingly tried most of what they were given. There was no whining or complaining, and we all ended up with full bellies. I call that a success. We had Quick Minestrone Soup tonight — which was made in under 20 minutes — accompanied by whole-wheat breadsticks that I manufactured out of my simple pizza dough recipe. (The extra bonus of that arrangement, besides the fact that the pizza dough is so cheap and easy to make, is that I have plenty of raw dough left downstairs to do a fun experiment for the kids’ lunchboxes tomorrow.) 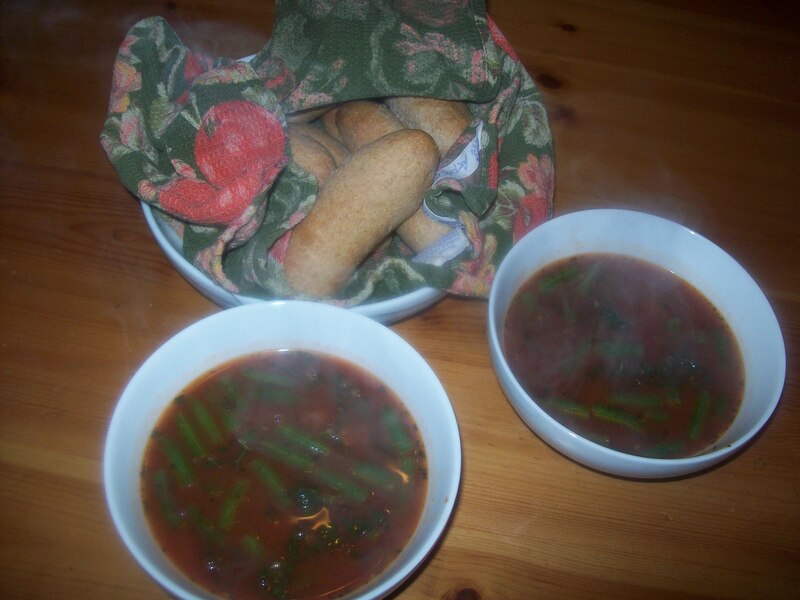 Anytime my boys see homemade breadsticks, they hop straight up to the table; and anytime I’ve got a bowl of soup, I’m looking for something to soak in it. We were all happy with the arrangement tonight. The way I made the soup was not super-traditional, but it was modeled on minestrone; and the great thing is, it’s more like a template for soup than a recipe, because you could substitute practically anything you like (or happen to have on hand) for what I used in this soup. My choices for ingredients were basically dictated by only two concerns: price, and getting the best nutritional outcome for that price. I didn’t want to present a total cop-out as my $1 meal. AND…there are about four servings of soup left. Damn. I should’ve splurged on a little Parmesan cheese for the bread! The beef base, by the way, is a new thing I’ve discovered, and you could DEFINITELY omit it if you’d prefer. My reasons for including it were to deepen the flavor of the stock; to give a quick soup a longer-simmered taste; and because I tend to like a minestrone that’s mainly vegetables, but has a little backnote of some meat, whether that’s pancetta, sausage, or beef broth. But it’s entirely fine to do without. I stumbled upon the beef base at Whole Foods when I was contemplating a substitute for traditional beef bouillon in an old recipe I have; a quick check of the ingredients proved to me that it wasn’t the WORST thing in the world, and using it occasionally in cooking with my usual fresh foods would likely not do any harm. Now I love the stuff for soup — it’s much less salty and more flavorful than bouillon, and a little goes a long way, so it’s more economical than it seems on the surface (I did cringe slightly at the price of a jar). So that’s it — the $1 dinner experiment, which could have included quite a few more ingredients, given all the leftovers we’ve got. I’m happy to have finished so strong and to have proven (if only to myself?) that this crazy hifalootin’ real food stuff doesn’t have to be completely out of reach for, well, just about anybody. Now if only we could convince the REST of the world…then we’d really be on to something. This entry was posted in Accountability, Cooking, Feeding kids, Food culture, Meal planning, Parenting and tagged baking, bread, cooking, family, Farmer's Markets, feeding kids, food, Household organization, kids' health, leftovers, lunchboxes, meal planning, parenting, recipes, soup. Bookmark the permalink. Small jar? Little bitty thing? If it’s the Better than Bouillon, you might be interested in the fact that the dark vegetarian tastes better. Don’t know that it’s healthier, but it tastes better. I could seriously eat the dark vegetable stuff (their “no chicken” is better than their chicken as well, a fine consolation for vegetarians!) out of the jar. Except it’s so salty so… no. It IS sometimes challenging, isn’t it? People who think about these things are passionate about these things, and passions sometimes get inflamed too easily. But we’re all in this for the right reasons here…and I love hearing what other people have to say! Which “beef base” would that be? Is it store brand, or…?